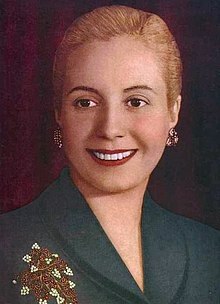 María Eva Duarte de Perón (May 7, 1919 – July 26, 1952) was the second wife of Argentine President Juan Perón. She was born in Los Toldos. She was the first lady from 1946 until she died and she served with her husband as a co-ruler of Argentina during those years. Before she died the Congress made her Spiritual Leader of the Nation. She was an actress before she married Peron. By the time of her death, she was one of the most powerful women, or maybe even the most powerful woman, in the world. She is known for her work in many charitable and feminist causes, and became an icon to many people in Argentina. Evita was President of the Peronist Women's Party, a big and powerful political party made up of women who supported the Perons' party. She ran the Ministry of Labor and the Ministry of Health. She helped legalize divorce in Argentina, as well as playing a pivotal role in enacting women's suffrage in Argentina.The Maria Eva Duarte de Perón Welfare Foundation gave a lot of funds, goods and medicine to the poor. The poor liked Evita Peron a lot. Her life inspired both a musical and a movie called Evita. The movie starred Madonna. Her cancer was detected during a hysterectomy in November 1951, but the doctors were encouraged by Juan Perón, to keep it to themselves in order to not influence the presidential campaign negatively. When she died (of cervical cancer, in Buenos Aires), her corpse was embalmed After her husband was overthrown, her body was lost for almost 20 years, until it was found in Italy. It was brought back to Argentina and buried with her husband after he died in 1974. It was brought back by the President, a woman named Isabel Perón, who was married to Juan Perón years after Eva's death. In memory of her life's work, a giant portrait on the front of Argentina's social development ministry was unveiled on 26 July 2011, exactly 59 years after her death. ↑ 1.0 1.1 "Bios". History TV. This page was last changed on 11 February 2019, at 19:24.